“I want MAGIC” screams Blanche du Bois in Tennessee Williams classic “Streetcar Named Desire”. And I was screaming “I want magic, too!” As Woody Allen’s latest “Magic in the Moonlight” unspooled before me and I didn’t laugh once. It LOOKS Magical. The cinematography of Darius Khondji is simply swoon-worthy. The Riviera never looked so lovely! Truly! But aside from a very, very strong performance by Colin Firth, it’s not much fun. Although Eileen Atkins as his sensible aunt (they’re both British of course) is also very good. But this film that looks like it should be a comedy, is simply not funny at all. Firth has the challenge of getting up in yellow-face and being a stage magician named Wei Ling-Soo, who makes elephants disappear and saws ladies in half, and is an extremely pessimistic curmudgeon. He spews venom constantly throughout the film in all directions, which is arresting, but not funny. Unlike the other recent magician in an Allen film, the great Splendini, in “Scoop” who Allen played himself. “Scoop” was set in London with Scarlett Johansonn in the female lead, a role Emma Stone essays so poorly here. “Scoop” was funny and good-natured as “Magic in the Moonlight” is bitter and grim. Good qualities in a drama, like “Blue Jasmine” but not is a half-baked pseudo-farce. How can this much heightened sarcasm be not funny in a Woody Allen film? Well, for one thing his character seems an utter realist, if not a downright atheistic. Yes, that’s right. This is a film that is about atheism. Or a comedy about atheism. WTF? It’s seems like it should be by Ayn Rand and black and white and set in the ’40s. Not the glamorous 1920s, a period Allen returns to again and again. And he’s done it better. I just watched “Midnight in Paris” for the umpteenth time last night and it delighted and chilled me all over again. I actually got goose bumps from it and from Mlle. Marion Cotillard’s superb performance. And there were actually French people in it. And they spoke French! Imagine that! In “Magic in the Moonlight” we have the beautiful French countryside, but no French people are in it. At All. And Emma Stone is very, very weak in this. As a supposed psychic, she’s a little spacey, a little kookie. Her red-hair flies beautifully in the wind. She has lovely large eyes, but Woody seems to have a problem with her overly large forehead which is covered up throughout much of the movie by her own bangs, which is fine and series of tam o’shanters, head-bands and hats with extremely low brows, which would look fine on Marion Cotillard, but on Stone they make her look odd. She is photographed soooo well in fact, she looked liked she’s acting, but she isn’t. The cinematography and costumes were acting FOR her. I didn’t ever think I would miss Scarlett Johansonn, but in this film, I did. Stone is really out of her depth here, and she shouldn’t be. 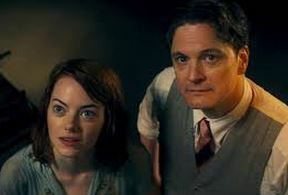 Unfortunately, it’s (no) “Magic in the Moonlight” that is all wet. Sadly. Every OTHER film of Woody’s recently has been terrific. “Midnight in Paris” was a masterpiece. “To Rome, with Love” was a dud. “Blue Jasmine” won Cate Blanchett an Oscar for Best Actress, and so we were due for another disappointment, and unfortunately, we got it. I can’t wait for the next one, however. That’ll be good again. Woody did a press conference in New York today. He NEVER does that. I sensed Flop Sweat and I was right. But Colin saved the day, and Jacqui Weaver was buoyant, too.